Creativity is rooted in a noble idea of welfare and happiness for the entire humanity. Saints and thinkers have throughout history been engaged in developing institutions for good governance so as to foster the multi-faceted development of each and every individual. The emergence of democracy, a form of government elected by the people themselves, can be said to be a fine product of this thinking process only. One, however, finds the desired good governance still remains a far cry. Due to lack of this, the remarkable feats achieved in the field of science and technology have meant little to the masses the world over. Economic development has by and large remained elitist. There is massive poverty, illiteracy, unemployment, mal-nutrition and squalor. India today ranks 100 in a world hunger list of 119 countries. Over 45 per cent of India's child mortality is due to hunger or undernutrition. Over 833 million, about 68 per cent, of Indians are living in rural areas. They continue to be in a bad shape. Prime Minister Narendra Modi's government put forth a plan for upgrading a cluster of 300 villages to 'Smart Villages'. But little has happened on the ground. fundamental reasons for the on-going massive migration the world over. According to authentic studies, there are the more than 60 million people worldwide who have been forcibly displaced. The number of irregular migrants has been on the increase. There are over 11 million migrants in the United States. India shelters over 20 million migrants. (See Khalid Koser, "International Migration. A Very Short Introduction, Oxford, 2016, pp-51-52.) Like it or not, the post-Independence state in democratic India has little to take pride in on the front of good governance. 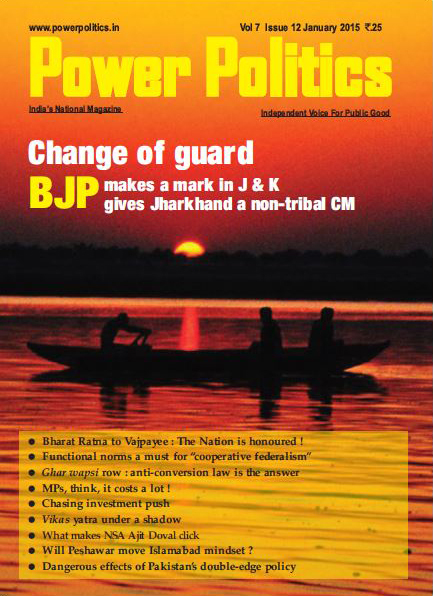 A lot has already been written in this column and elsewhere in this magazine on the poor record of our successive governments in addressing the problems, such as territorial aggression, communalism, casteism, gender discrimination, terrorism, poverty, illiteracy, and crimes against children, women, Dalits, Tribal and farmers the country have long been confronted with. It is disheartening to learn that India today ranks 100 in a world hunger list of 119 countries. Over 45 per cent of India's child mortality is due to hunger or undernutrition. (See 2017 Global Hunger Index). Over 833 million, about 68 per cent, of Indians are living in rural areas. They continue to be in a bad shape. In early 2015, Prime Minister Narendra Modi's government put forth a plan for upgrading a cluster of 300 villages to 'Smart Villages'. But little has happened. Decent life conditions — education, health care, environment and employment are nowhere in sight. Mahatma Gandhi India is basically an agricultural nation. But its farmers are still leading a life on the margins. The pressure of population on farming has been rising in India. Small and marginal farmers (with land holdings of less than 2 hectares) account for 72 per cent of land holdings. They have little marketable surplus. The costs of farm inputs have increased over the years. Their crop production is at risk because of the shortage of appropriate seeds, fertilizers and irrigation facilities. They do not get fair remunerative price for their products. Moneylenders continue to exploit them. The condition of the farmers community is so bad that every year many farmers are driven to commit suicide. It's high time our political class, ruling or opposition, took to self-introspection, realized why and where they have failed in governing the nation in the spirit of our democracy. 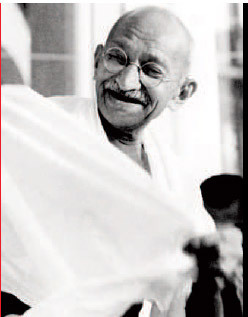 Mahatma Gandhi's famous goal for Independent India was 'antyodaya'- -- the rise of the last man in our society. Will our political leadership follow Gandhi ? 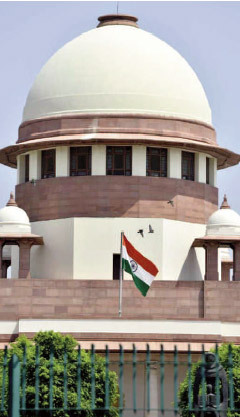 Supreme Court of India One of the fundamental reasons for the lack of good governance and allinclusive development in India is that our political class has by and large not been true to the spirit of the Constitution of our Republic. This demands our judiciary to be pro-active and direct the Government wherever it deviates from the socio-economic agenda defined in our Constitution. Regrettably, all is not well with our legal system today. Recently, four senior judges of the Supreme Court publicly accused India's Chief Justice of selectively assigning cases of "farreaching consequences to the nation." It is unfortunate that these judges transcended the established judicial protocol that forbids them to interact with the media. But it seems they had little option. The judges complained they had collectively tried to persuade the Chief Justice to take remedial measures but their efforts failed. I don't understand why the CJI should not have heeded their advice in the matter. This has long been well-settled that the Chief Justice is the master of the roster. This institution alone can decide the composition of Benches and allot judicial work. But at the same time, an established convention of the court goes that all important cases of public interest or sensitive matters should be heard first by the CJI. If the CJI is not willing to do so for some reason, it should be assigned to his next seniormost Well-meaning groups across the nation have rightly suggested that a Full Bench of the apex court headed by our Chief Justice could ponder over and resolve all the issues that have been raised by the judges. Democracy cannot afford judicial infighting in the apex Court itself. An independent and impartial judiciary is the hallmark of our democracy. It needs to stand as a rock in defence of democracy. The greatest threat to our democracy today is from the alleged criminal elements who have entered our legislative institutions. According to an estimate, 34 per cent of our Members of Parliament have criminal cases pending against them. The scenario in our legislative bodies in various provinces is not much different. Elected representatives legislate and ultimately run our parliamentary government. If the representative themselves are corrupt, our political system cannot be meaningful in ensuring good governance and fostering allinclusive development. Given this fundamental truth about our political system, the Supreme Court has recently done well to ask the Centre to come up with a scheme to establish special courts to try politicians facing criminal cases. Earlier, the Supreme Court had directed that all cases against politicians be disposed of within one year. The Supreme Court must assert whenever it is needed in the interest of India's democracy and Constitution. For that the Court's own integrity must remain beyond any shadow of doubt. judge.